Gordon, Stanley. "James McGill". The Canadian Encyclopedia, 26 September 2017, Historica Canada. https://www.thecanadianencyclopedia.ca/en/article/james-mcgill. Accessed 24 April 2019. Showing an unusually strong affection for his adopted city, he was also active in its public life, holding several important appointments in municipal and provincial affairs. 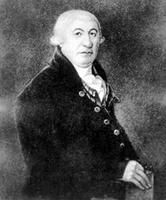 James McGill, merchant, philanthropist (born 6 October 1744 in Glasgow, Scotland; died 19 December 1813 in Montréal, QC). One of the Montréal merchants primarily concerned with the fur trade south of the Great Lakes in the 1770s and 1780s, he began diversifying his commercial activities in the 1790s to include land speculation and by 1810 had withdrawn from the fur trade altogether. Showing an unusually strong affection for his adopted city, he was also active in its public life, holding several important appointments in municipal and provincial affairs. When he died, reputedly the community's richest citizen, he willed, among other philanthropies, an endowment of land and money with which to establish the university which bears his name.